Raccoon is a powerful totem. These fuzzy ninjas of the night represent protection and generosity. It is common for males to band together for greater strength against predators or other male raccoons from different territories. A group of raccoons is called a gaze. The gaze will have a dominant male who will stand watch and defend the group while the others forage for food. The best morsels will be given to the dominant male as a sign of respect and gratitude for the protection he offers. Raccoon is generous and protects the young and elderly. They are the guardians for those who feel like a dark horse, the underdog. They offer strength and wisdom gained from self experiences. If Raccoon has bumbled it’s way across your path, it is time to share your wisdom with others in need. Does anyone around you need help or guidance that you can offer? You possess knowledge that you have worked hard to obtain. It is time to share this with others. Do not become a crutch but rather equip them with the tools necessary to obtain their own strength. Lift them up, dust them off and show them the way. Speak up when others speak ill behind another’s back. Do not tolerate unfounded judgement and gossip. Recognize the guardian within you. The protector is always rewarded for their great deeds. Though beware of those who refuse to help themselves; those who are lazy and greedy. They will drain you of your resources while refusing to learn how to stand on their own. Perhaps it is you that needs to be lifted up. Are you stuck in self pity and feeling like you’ve hit rock bottom. Change your perspective and see the strength you hold within. Do not become a victim but fight. Help someone. Do not become selfish but instead be giving. The gratitude and appreciation you will receive for helping another will give you the boost of confidence you need. On the contrary, Raccoon could be warning you to take time for yourself. Female raccoons often live solitary lives excluding mating season and when raising young. Have you been giving too much energy and have left nothing to care for yourself. An empty pot feeds no one. If you do not tend to your own needs first, you will have nothing to offer those who depend on you. Take time for yourself and recharge. this piece as well as moose and owl. I’ll talk about Owl symbolism next week! My prismacolor pencils are preforming beautifully and I can’t wait to finish these three totems completely. I have much more coming that I’m excited to share with everyone. I hope you’ve enjoyed learning the different totem animals with me. I know I have! What raccoon stories do you have to share? Leave a comment below and thanks for stopping by this week! I have always wanted to see a moose in the wild. I have yet to have the opportunity but until then I can incorporate them into my work. I enjoyed creating this piece very much. I still try to rush through my work sometimes if I get too antsy but creating zentangles and doing so in pen forces me to slow down. To enjoy it more rather than being overwhelmed, feeling the urge to hurry and finish pieces. It is not the destination. It is the journey. Moose is a powerful totem for self esteem. Perhaps that is why I was able to approach this piece more calmly and confidently than I felt creating the bear. If you are a lucky soul who have encountered these massive beasts in the wild, you may have heard the male and his mighty call. They confidently holler, looking for a mate as they strut their massive rack, sometimes weighing up to 40 pounds! They are the largest deer species in the world. If Moose has crossed your path today, it may be time to start giving yourself a little more credit for your accomplishments. No matter how big or small, everything we achieve is worth a “good job” and we must tell ourselves that. Encourage yourself and become empowered with your “git ‘er done” attitude. Moose energy gives you the power to encourage others to get the work done while also not being afraid to get your own hands dirty. You are a leader; a leader that can lift the ones around you. Wisdom comes from Moose and is often associated with our elders. The wise ones that have the knowledge and encouragement that is to be given to the younger generations. Moose tend to eat tall grasses so there is no need to keep their heads low in an uncomfortable manor. You too should hold your head high, taking great pride in the success you have achieved and the enlightenment you can offer to others in having such a confident attitude. Or maybe you are being too bull-headed? If taken too far, this confidence can be turned into selfishness. Do not stand on top of others while you keep your head held high. Becoming too egotistical is detrimental to you and your relationship with others. Do not forget that we all have something to learn and everyone has something to teach. No one is better than the other. If we lose sight of this, we are hindering our opportunities to grow further. Between Bear and Moose, I’d say it is time to stand strong in my decisions and continue with confidence. This way of life becomes easier the more I work on my art. So I will continue to do so! Stop by again soon to check out the next totem animal, the raccoon! I hope you enjoyed this weeks post. Have you seen a moose in the wild? What lessons has Moose taught you? Share your story in the comments below! Thanks for reading! 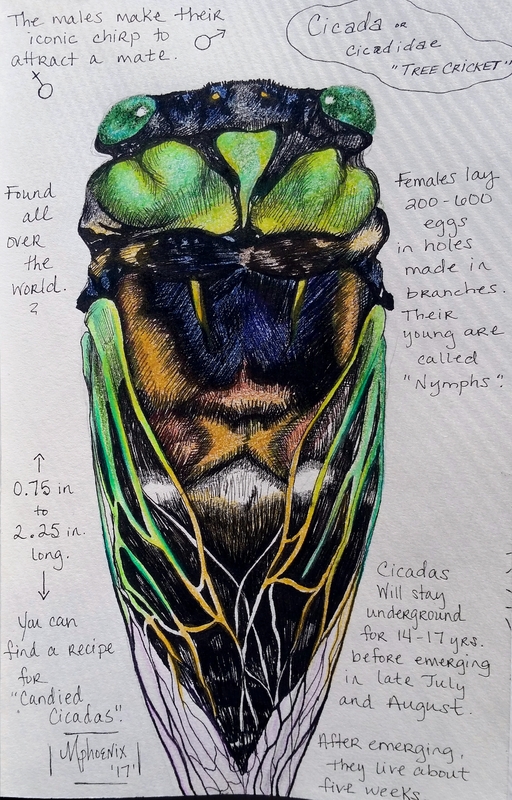 I took a small break from ZIA’s and did a realistic sketch of my latest inspiration, the cicada. I have been seeing an abundance of them this year and learning so much about them. They are oddly beautiful. Like a, “Your so ugly, your cute” kind of thing. Their colors are so vibrant with an iredescent shine. Their bulbous eyes are bizarre and there underbelly is segmented and limby. They look like something from a monster movie. You can hear them humming. A rythmical beat of all of them singing together. Well, the males at least whom call for a mate. Once they have mated, a female will lay 200- 600 eggs in a hole on a tree branch. Once the young (or nymphs) have hatched, they will make their way underground and attach themselves to the tree’s roots. There they will stay there for 14- 17 years, depending on the species, feeding on tree sap. Then when their time has come, instinct tells them to rise above ground again where they will shed their skin and become the chiming cicadas we are all familiar with. They will live for another five weeks or so above ground. This gives them just enough time to find a mate and have the next generation start the whole process over again. So what does the cicada have to tell us? By emerging from the ground in one form and so rapidly changing to the next, it shows us that a complete metamorphosis is on it’s way. We have been laying dorment for many years; transformation is upon us and we must not fight nature. Shed your skin and sing your song. The cicadas are calling to each other, telling us to use our voice. We can no longer hide underground in the dark and silence. We have been born anew and should freely express ourselves as the individuals we have strongly grown into. Cicadas also represent happiness and joy. Ultimately, we have tranformed from nymph to what we were truly meant to be. A greater version of ourselves than before. That is something to be joyous about. Be proud of the the person you have worked so hard to become. Your metamorphosis is complete. What a rush! I hope you enjoyed reading about these oddities of nature. What stories do you have to share about the cicada? Leave a comment below. Thanks for stopping by this week! The creepy crawlers have been plentiful this year. Everyday that I work outside, I find a new critter to marvel at. I have seen quite a few cicadas and cicada killers. The butterflies have been fluttering about and I have even seen a group of hummingbird moths this year. There has been an abundance of spiders as well! 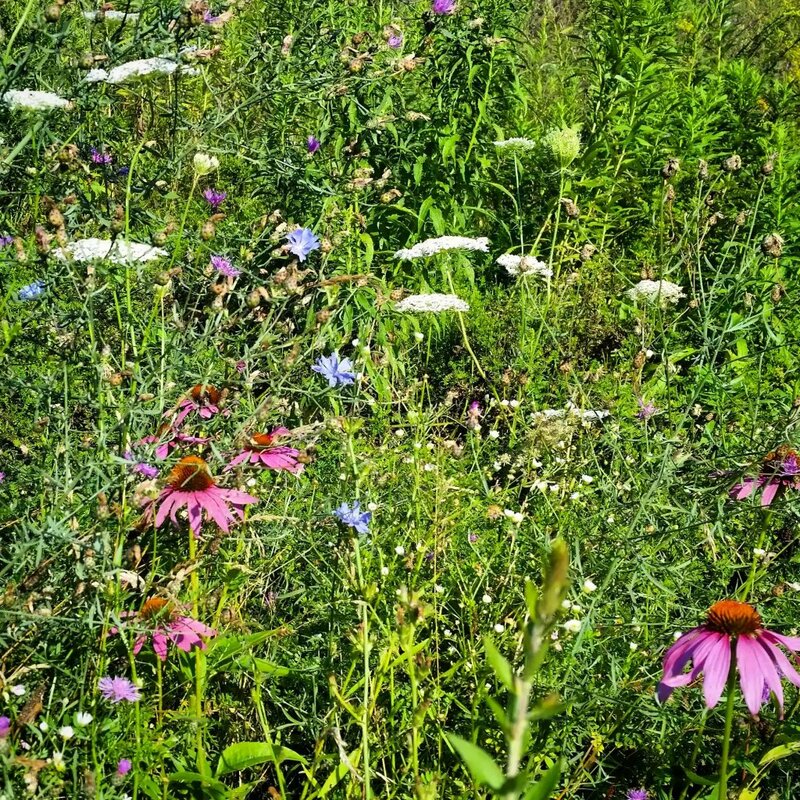 With all this rain we have been getting, the gardens are full and vibrant. I can’t help but take a photo everytime I’m outside. I have compiled a few of my favorite bug and botany photos from the season. What a beautiful year! Hickory Tussock Moth Caterpillar (Lophocampa Caryae) Be careful around these guys and don’t touch them! Their hairs will get stuck in your skin and irritate you the same way poison ivy will! Itchy!! Striped Petunias – Petunias originated in South America and there 35 different species. Black Swallowtail, female (Papilio polyxenes) also known as American Swallowtail or Parsnip Swallowtail. Knock Out Roses, a hybrid from the Rosa genus. Thanks for stopping by this week! I hope you enjoyed my collection. If anyone can identify that last moth, please feel free to leave a comment below! Or if you have any stories about creepy crawlies you have seen this summer, please share! You can hear them calling. It’s like a choir in the night. What are they singing? Native American teachings say they are calling for the rain. Frogs embody water medicine. Water surrounds their entire existance. They begin life in the water and they must learn to swim with it. Only when they have mastered fluidity do they transform. Then they can leap out and venture forth! If Frog has hopped along your path, it is time to heed your emotions. What baggage have you been carrying around with you? It disrupts your inner peace and prevents you from growing. That is why Frog has found you. It calls for the rain in order to cleanse your soul. The water washes away the filth and leaves your spirit bright. Frog tells us it is okay to cry. Our tears flush our bodies of the negativity we have buried inside. Once we eliminate what has been weighing us down, both mental and physical, we can grow by leaps and bounds! I’ve been seeing a great deal of frogs lately. I enjoy listening to them. It is truly music to my ears. 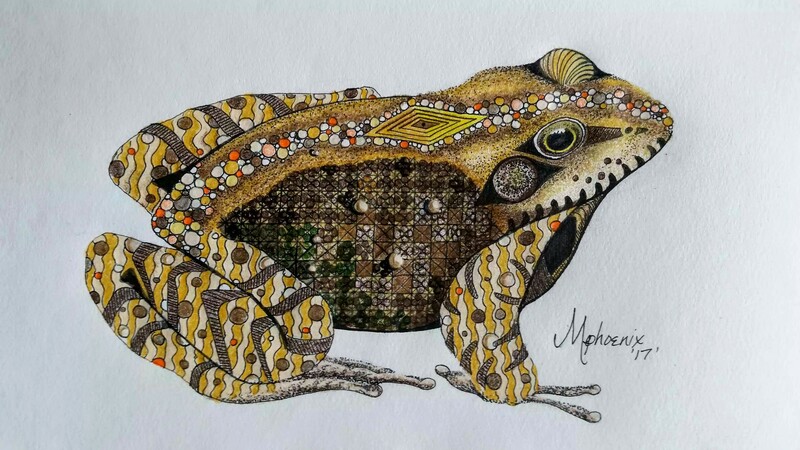 I was inspired to do my latest zentangle piece of the frog. It was easy to match tangles to the texture of the frog’s skin. I think it’s amazing how patterns are all around us and we don’t even notice. That’s why I can’t stop doing zentangle inspired art. It opens your eyes in a whole new way! It’s phantasmagorical! It’s a real word, look it up! Thanks for stopping by this week. If you need some rain, I hope it pours for you! 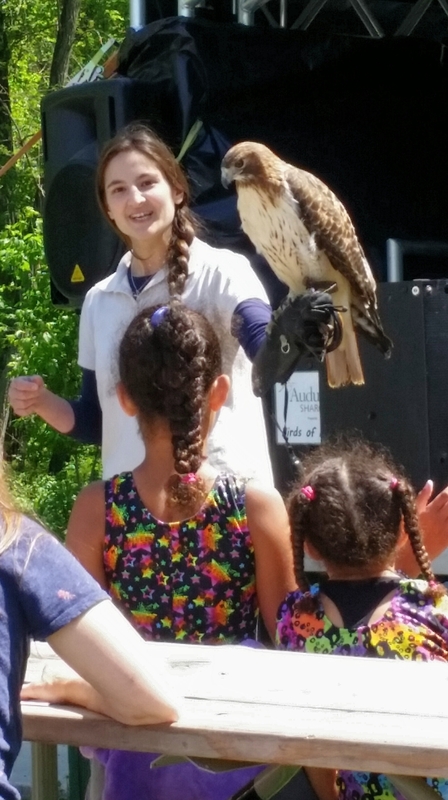 This past weekend my family and I went to Raptor Fest at Schodack Island State Park. No, it wasn’t dinosaurs. 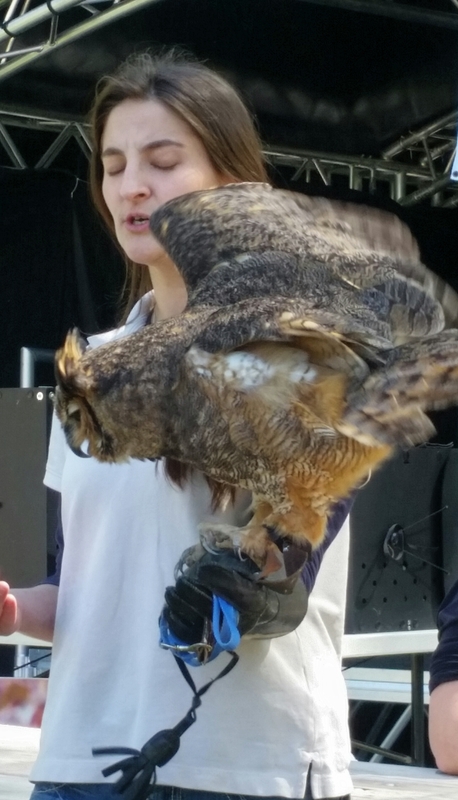 It was all about birds of prey. I had to work that morning so we showed up at the tail end of the event. Haha….tail end….see what I did there. 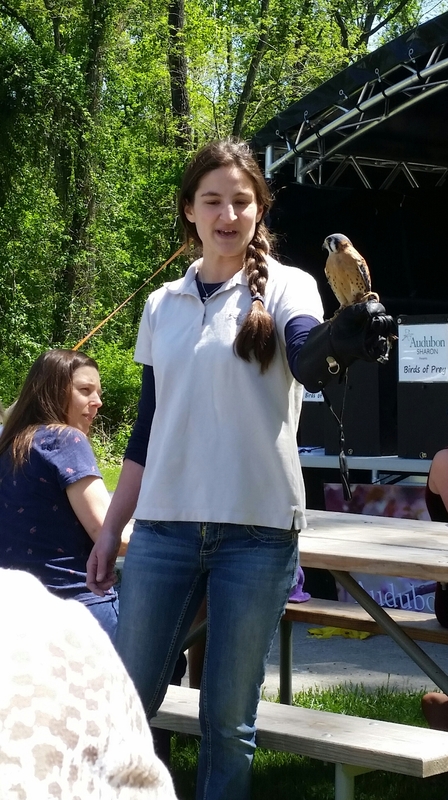 Anyways, the festival was hosted by the Audubon Society of the Capital Region. 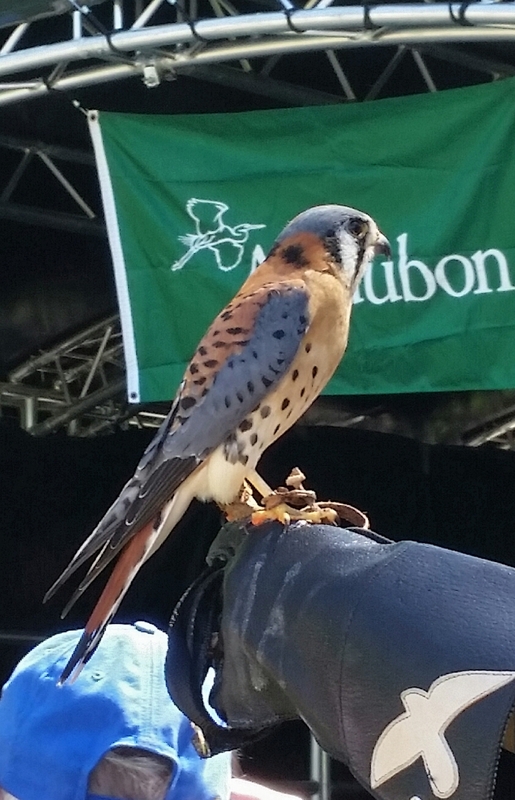 They are an organization that started in the 1890’s to protect birds and their habitats. You can read about the history of the organization here. 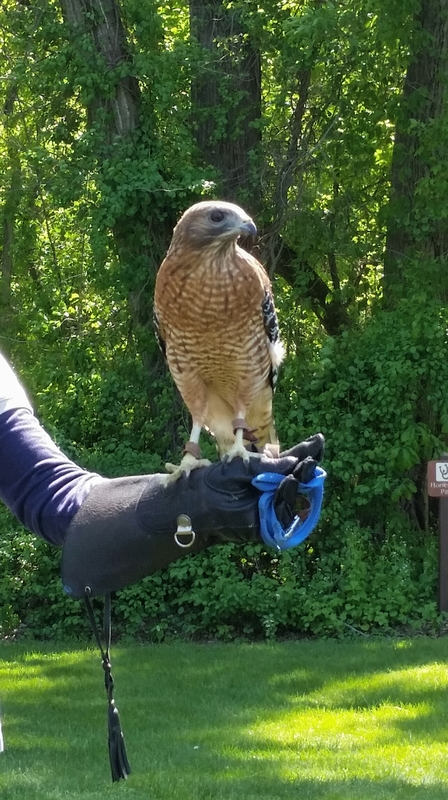 We were able to catch a fantastic seminar about raptors in the area which covered Kestrels, a couple owls to include the Great Horned, and a couple hawks. 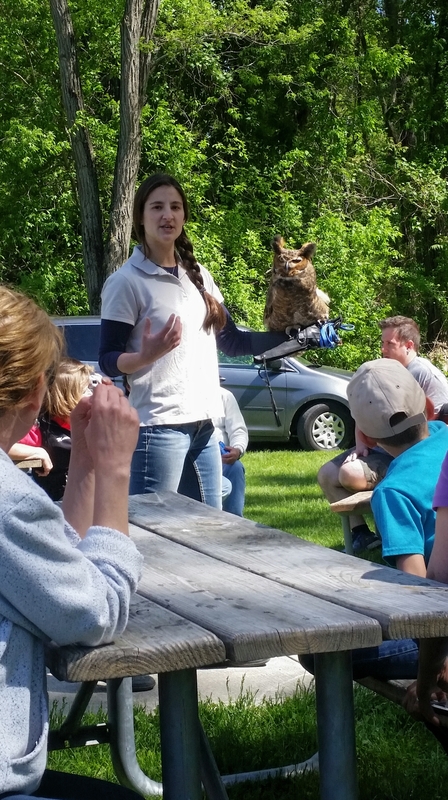 Sharon, the representative from Audubon, gave a great presentation and was very informative. 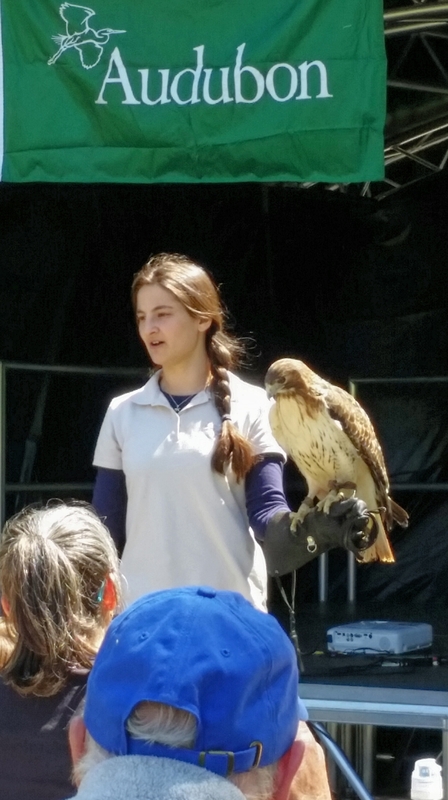 I learned about some of my favorite birds and was introduced to some new ones as well. 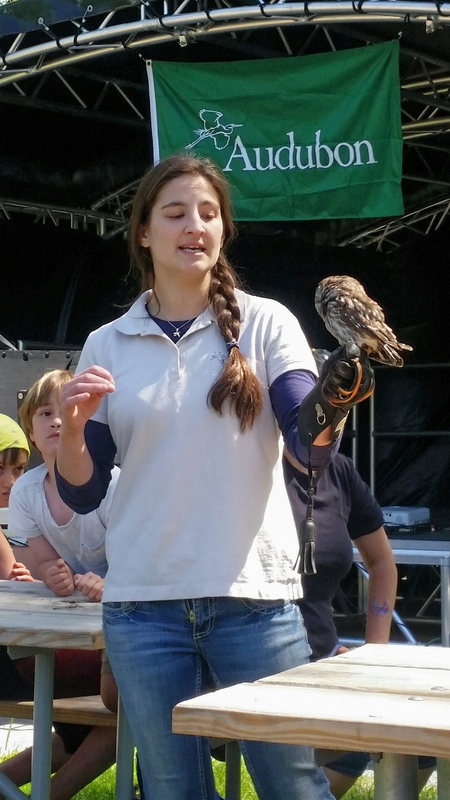 She would bring out each raptor one at a time, perched on her arm. They were beautiful and well cared for but unfortunatley were unable to be released back into the wild for one reason or another. 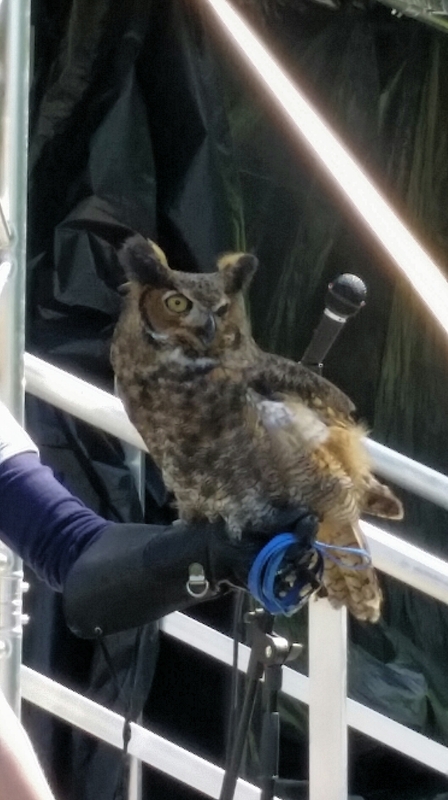 The Great Horned owl sadly was hit by a car and lost a wing. 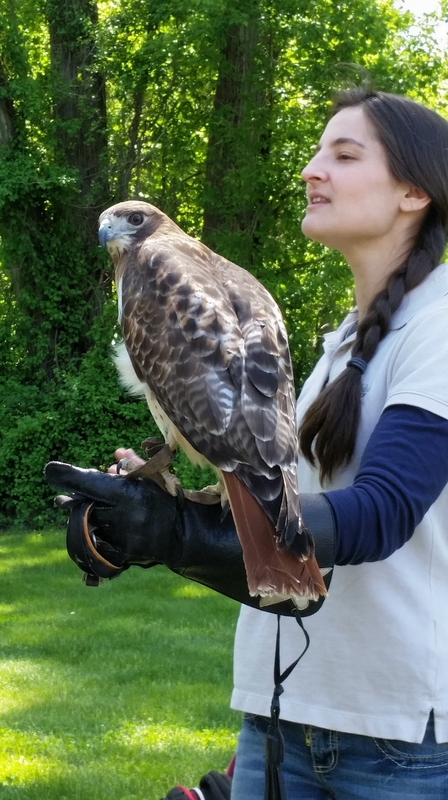 One of the hawks suffered an eye injury and the others were found as hatchlings and raised by people. Therefore, imprinting with humans. 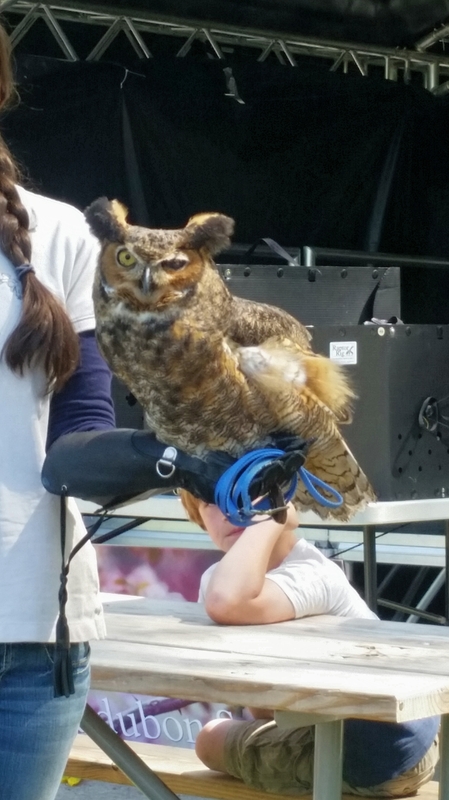 There were also vendors and other organizations related to raptors and nature preserves. I wish we could have made it for the entire event but just seeing that one seminar made it worth going. We had a great time at a beautiful park on a beautifully sunny day. 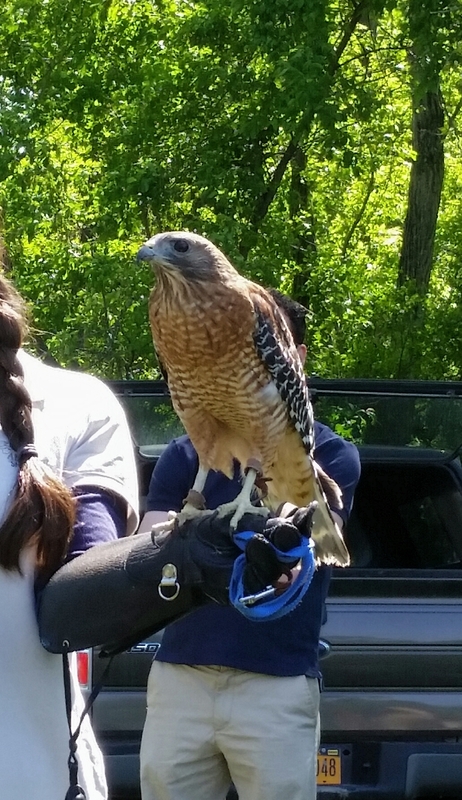 Have you ever been to a Raptor Fest before? 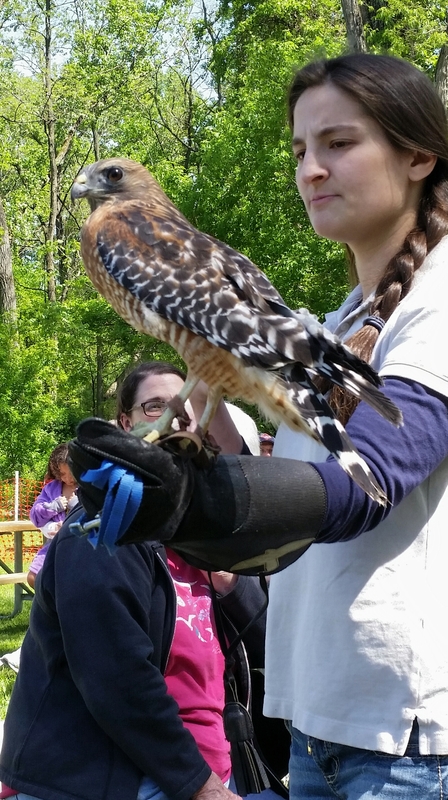 Do you have a favorite raptor? Leave your story in the comments below! Thanks for stopping by this week! Time keeps on tickin’, tickin’, tickin’ into the future! It sure is flying by and I can’t seem to find the time to get everything done! I started a new job doing landscaping so I’ve been spending a lot of time in the sunshine! …..I wasn’t able to draw much this week but I did manage to get a sketch done. My husband inspired me to do this sketch. He will blurt out random phrases for absolutely no reason. I don’t know how he comes up with some of the the things he says. One that has stuck for a while is “giraffes and waffles”. It is completely random and it makes me smile everytime I think about it. I was trying out a new calligraphy set I have and did the entire drawing with it. I figured a calligraphy pen could produce some pretty neat designs for a zentangle related piece so I wanted to mess around with it. 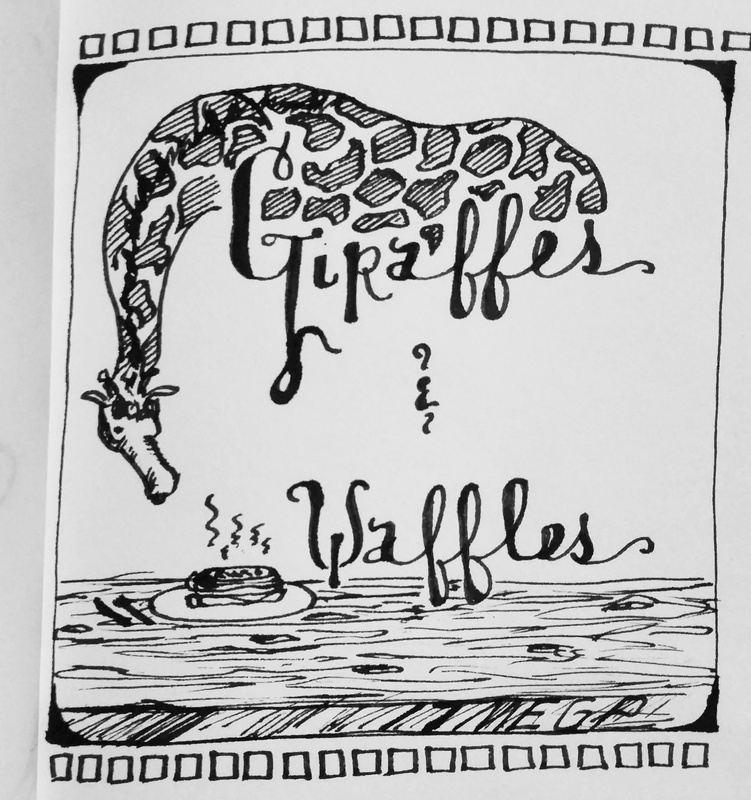 And there you have….Giraffes and Waffles! Thanks for stopping by this week! I hope you enjoy some randomness this weekend!